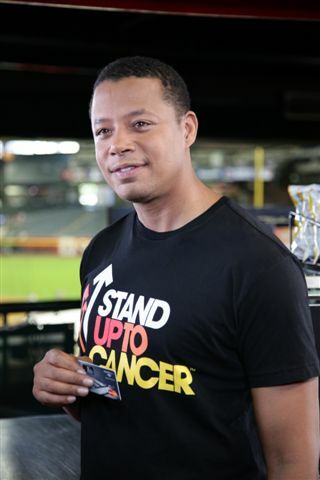 On Sunday afternoon, I conducted a brief phone interview with actor Terrence Howard (Crash, August Rush) to discuss a campaign he is doing with MasterCard and my favorite charity - Stand Up To Cancer. I was really looking forward to speaking with him since I loved him in the chilling movie The Brave One with Jodie Foster, plus he's also really handsome. And although I've seen him before at other SU2C events, I never chatted with him. Waiting for his call had me all giddy and nervous. The interview went well, but since it was on my cell phone, we kept accidentally talking over one another in the beginning. He was super sweet and a bit soft-spoken. He even said if I had any other questions in the future I could call him. Not that I'd be that stalkerish, but how nice of him to say. You can read my interview and learn more about the new initiative in my Huffington Post article: Help Terrence Howard and MasterCard Raise $4 Million. Excellent article. He seems like a really nice guy. This is the real one. Won't settle for anything else.